The thyroid is essential for maintaining heart rate, regulating body temperature and supporting many other body functions, including metabolism, reproduction, digestion and mental health. The thyroid hormones penetrate every cell and regulate how they make energy. When women pass age 35, their thyroid often starts sputtering. And when thyroid hormone levels drop even a bit, every cell in your body slows down. From your brain to your fat cells and joints, your organs go on strike. Every woman over age 35 should have thyroid tests as part of her annual checkup. However, the standard test given measures TSH (thyroid stimulating hormone). But it's notoriously misleading, because it doesn't measure the actual hormones your thyroid produces. Demand tests of "Free T-3" and "Free T-4." These are the thyroid hormones your body actually uses. "Free" means the hormones are chemically available to your cells. . The best-selling treatment is Synthroid®, a synthetic form of T-4, which your body theoretically converts to T-3. But it doesn't work for every woman. Often your body can't convert it to T-3. The natural solution. For many women, the best treatment is a natural thyroid extract that contains both T-4 and T-3. Not only is it more effective, but it costs a lot less. If your thyroid levels are just a bit off, you may not even need hormones. A natural amino acid can help your thyroid manufacture its own hormones. Discuss with your holistic practitioner. fatigue is a common symptom of both hyper- and hypothyroidism. A cause of hypothyroidism, more common outside of the US, is iodine deficiency. 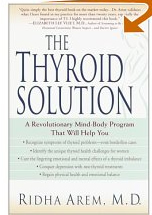 Iodine, which must be supplied by the diet, is an essential component of thyroid hormone. If there is insufficient iodine available in the diet, enough thyroid hormone cannot be produced, and this leads to hypothyroidism. environmental / food toxins as they inhibit production of thyroid hormone. For example fluoride and bromide. Bromide is a common endocrine disruptors. As bromide is also a halide, it competes for the same receptors that are used in the thyroid gland to capture iodine. This will inhibit thyroid hormone production resulting in a low thyroid state. Bromide can be found in several forms. Methyl Bromide is a pesticide used mainly on strawberries, found predominantly in the California areas. Brominated Vegetable Oil is added to citrus drinks and Potassium Bromate is a dough conditioner found in commercial bakery products and some flours. age itself can be a factor, as our metabolic and immune systems slow down, we are more prone to infection and immune disease, both of which can manifest as hypothyroidism. The vast majority of hypothyroidism cases are caused by Hashimoto's thyroiditis, a condition more likely to affect women, in which the immune system attacks the thyroid gland. Selenium Deficiency: Dr. Havashida raised the topic of a relationship between selenium deficiency and hypothyroidism. Click here for details. Daily Health News contributing medical editor Andrew L. Rubman, ND, states: "Thyroid disease is rarely a simple problem with one cause," he said. "It's complex and needs to be treated as part of an overall physical assessment." Dr. Rubman says it's a good idea to have your naturopathic physician collaborate with your medical doctor to find treatment approaches beyond medication. He emphasizes the importance of supporting the thyroid naturally with a healthy lifestyle, good nutrition, regular exercise and stress management to decrease the odds that disease will develop, noting that factors such as insufficient dietary iodine may confound the problem. Though body temperature was once thought to be a reliable measure of thyroid function, this has largely been discredited, says Dr. Rubman. Get regular thyroid screenings. According to the American Thyroid Association, if you are 35 or older, you should have your thyroid tested at least every five years. Learn about your family history for thyroid disease. Thyroid disease, such as Hashimoto's thyroiditis, is often hereditary. If a family member has thyroid disease, you are at increased risk. Take charge of your own care. If you suspect you may have thyroid disease, find an open-minded doctor to talk to, someone who is willing to look beyond the TSH test and take your symptoms seriously. Choose a physician who focuses on you as an individual. Don't just give up if your TSH results are normal yet you still suspect thyroid disease. Urge your doctor to look further, or consult a board-certified endocrinologist or naturopathic physician with a specialty in endocrinology. You can use The Hormone Foundation (www.endo-society.org/apps/FindAnEndo2/) as a resource to find an endocrinologist. Minimize environmental toxins. Eat as many fruits and vegetables as possible. Reduce consumption of animal fats in dairy products, processed foods, meats and poultry, as they tend to harbor toxic chemicals. Buy organic foods whenever you can. Reduce stress through relaxation and exercise. As always, these are the cornerstones of physical and mental health. Eat right. Good eating habits, adequate digestion and regular dietary sources of the building blocks of both thyroid hormones -- the mineral iodine and the amino acid tyrosine -- can only help. Sources of iodine include seaweed, shellfish (shrimp, clams, oysters) and iodized salt. Tyrosine, a non-essential amino acid, is produced from foods including soy, chicken, turkey, peanuts, almonds, avocados, bananas, lima beans, pumpkin seeds and fish. Supplements, such a good quality Cod Liver Oil, are also an option. There are some lemon-flavored version that are not unpleasant to eat (click on the link for more info). . Herbs supportive of the Thyroid function are: Mullien, parsley, kelp, black walnut, Irish moss, bayberry, white oak bark, skullcap, black cohosh, sage (gets rid of toxins). As well as Kelp. (There has been some controversy about Kelp containing some toxic components maybe caused by polluted waters. Discuss this with your physician.) The seaweed Fucus vesiculosus (Bladderwrack) has been used in the past, and whilst it has much to offer it is only truly specific where an iodine deficiency is present. Sea Vegetables / Sea Weed: Sea vegetables offer the broadest range of minerals of any food, containing virtually all the minerals found in the ocean-the same minerals that are found in human blood. Sea vegetables are an excellent source of iodine - an important mineral for thyroid health; as well as vitamin K, a very good source of the B-vitamin folate, and magnesium, and a good source of iron and calcium, and the B-vitamins riboflavin and pantothenic acid. In addition, sea vegetables contain good amounts of lignans, plant compounds with cancer-protective properties. Supplement with Selenium (please refer to below) if selenium levels are low. Dr. Havashida raised the topic of a relationship between selenium deficiency and hypothyroidism. T4 deficiency can occur in several ways. It is often associated with dietary iodine inadequacy, commonly exacerbated by goitrogens in water or food supplies (Matovinovic, 1983). Goitre also may occur in individuals consuming excess iodine. To illustrate, in China, it is associated with drinking water containing > 300 micrograms/liter of iodine or the consumption of large quantities of seaweed (Tan et al, 1990). Depressed serium T4 levels, however, are not necessarily accompanied by below normal serum T3. When severe iodine inadequacy is present, serum T3 tends to remain stable, or may even rise as T4 levels drop (Pharoah et al, 1976). This relationship occurs because T3 contains less iodine, weight for weight, than does T4. It is, however, more metabolically active and hence is produced by the thyroid when iodine is scarce (Hatzel, 1989). Only in extreme iodine deficiency, when there is inadequate iodine even to produce T3, does its level decline. However, the T4 to T3 conversion requires the catalytic selenoenzyme iodothyroninedeiodinase. As a consequence, T4 and T3 deficiencies together are commonest in individuals living in environments depleted in both iodine and selenium. In contrast, depressed T3, without unusually low serum T4, is a characteristic of the populations of regions where diets contain adequate iodine, but lack selenium. Furthermore, animal studies suggest that just as excess iodine consumption results in lowered serum T4 levels, an elevated intake of seleniummay depress serum T3 (Benheet al, 1992). Kelp contains nearly thirty minerals which nourish the glands (especially the thyroid and pituitary). By enhancing the action of the glandular system, it helps balance the body's metabolism and rate at which it burns calories. Kelp, also known as seaweed, grows in the rich ocean beds, far below surface pollution levels. Because of its high nutrient content, this herb is reputedly beneficial for a wide range of applications. It is known to nourish the sensory nerves, brain membranes, also spinal cord and brain tissue. Kelp contains alginic acid which can help protect the body against the effects of radiation. "